In addition to strengthening capacities of BiH institutions by demand-driven involvement of their representatives in our Research Fellows Program, MEASURE-BiH also works on strengthening their capacities through demand-driven direct custom-made technical assistance and training in M&E. We currently provide such assistance and training to the Ministry of Family, Youth and Sports of Republika Srpska (RS), High Judicial and Prosecutorial Council of BiH (HJPC) and CSO implementers and grantees of USAID Civil Society Sustainability Project (CSSP). We have assisted the Ministry of Family, Youth and Sports of Republika Srpska in developing a monitoring system for the 2016-2020 RS Youth Policy. Follow-on on-the-job training for the operational staff of the Ministry. In 2015, USAID/BiH tasked MEASURE/BiH designing Judicial Effectiveness Index of Bosnia and Herzegovina (JEI-BiH), in response to needs of donors and other stakeholders for a reliable measuring tool to track BiH judicial performance. Within this task, MEASURE-BiH designed JEI-BiH in close cooperation with the High Judicial and Prosecutorial Council of Bosnia and Herzegovina (HJPC). HJPC has worked closely with MEASURE-BiH since early 2015 and has been actively involved in all stages of the design and development of JEI-BiH. Through its Presidency and the Secretariat, as well as through the members of the Council and the Standing Committees for Judicial and Prosecutorial Efficiency, the HJPC provided its subject-matter inputs and expertise, dedicated its staff’s time, and showed utmost responsiveness in providing administrative data and assistance in conducting the Survey of Judges and Prosecutors in BiH in both 2015 and 2016. Moreover, the HJPC has actively disseminated the JEI-BiH findings both to the public and to the wider professional judicial community at the HJPC’s Conferences of Courts’ Presidents and Chief Prosecutors. The HJPC also publishes the JEI-BiH reports on its official website. So far, two annual JEI-BiH reports have been prepared and published by MEASURE-BiH, for 2015 and 2016. The 2015 JEI-BiH Report (available at http://vstv.pravosudje.ba/vstv/faces/vijesti.jsp?id=62210) was presented and adopted at the HJPC’s session held on February 11, 2016. Upon the official endorsement of the JEI-BiH by the HJPC, MEASURE-BiH engaged in a series of presentations of the JEI-BiH methodology and the 2015 results to the main stakeholders - i) USAID/BiH and the U.S. Embassy, ii) the public through the HJPC’s public outreach event, and iii) the broader professional judicial community through the Annual Conferences of Court Presidents and Chief Prosecutors. Printed versions of the 2015 JEI-BIH Report were distributed at these events (both English and local language versions). Overall conclusion from all of these events (Exhibit 1) is that JEI-BiH has been well received by both USAID/BiH and professional judicial community in BiH. Recognition of the professional judicial community is evident from the following official conclusion adopted at the HJPC Annual Conferences of Court Presidents and Chief Prosecutors held in Teslic on May 30-31, 2016: "The Conference of Courts’ Presidents/Chief Prosecutors welcomes the introduction of the Judiciary Effectiveness Index (JEI), which is recognized as a unique and innovative tool for assessing the effectiveness of the judiciary in BiH. Judicial institutions shall use this tool for reviewing trends in the judicial sector, and to keep examining causes of trends and values in index indicators in order to take targeted measures aiming to improve them.” The JEI-BiH Methodology and 2015 Results Report was published on both USAID DEC web site and HJPC official website in June 2016. The 2016 JEI-BiH Report (available at http://vstv.pravosudje.ba/vstv/faces/vijesti.jsp?id=62210) was presented and adopted at the HJPC’s session held on April 13, 2017.The Council endorsed the Report and adopted several conclusions outlining Council’s planned measures to be taken based on the JEI-BIH findings, including: i) Council’s Standing Committee for Efficiency of Courts and Standing Committee for Efficiency of Prosecutor Offices using the JEI-BiH to note the trends in BiH judiciary and individual index values in order to conduct further analyses of causes and recommend specific improvement measures; ii) Council’s Standing Committee for Efficiency of Courts and Standing Committee for Efficiency of Prosecutor Offices considering possibility of designing 16 regional JEI-BiH Sub-indices; iii) holding presentation of the 2016 JEI-BIH results at the HJPC Annual Conferences of Court Presidents and Chief Prosecutors; iv) holding 16 regional presentations of the 2016 JEI-BiH results for all judges and prosecutors in BiH; v) introducing the JEI-BiH findings to the public, and vi) submitting an HJPC candidacy for the Council of Europe "Crystal Scales of Justice” 2017 Award based on HJPC’s usage of this Index for informed-decision-making in managing BiH judiciary. Acting on these conclusions, HJPC’s Standing Committees for the Efficiency of Courts and Prosecutor Offices decided to develop 16 JEI-BiH sub-indices based on HJPC’s administrative CMS/T-CMS data in order to further examine issues in individual courts and POs and subsequently design adequate and targeted interventions. 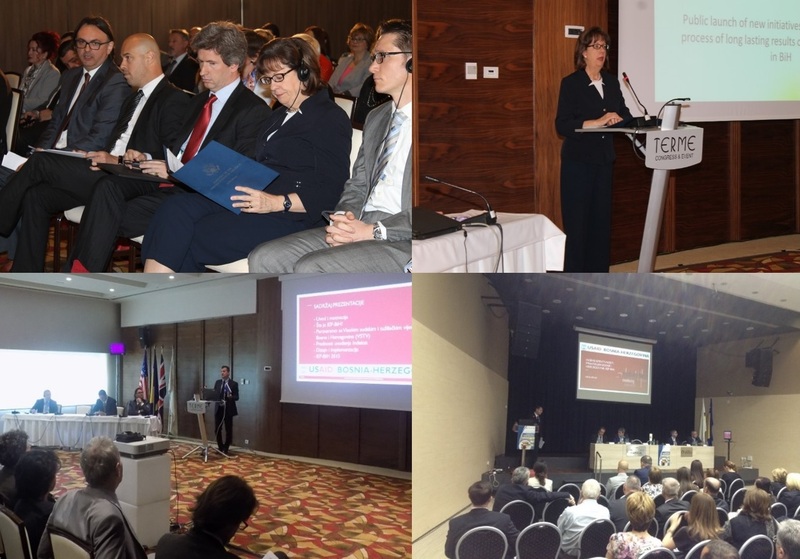 four regional presentations of JEI-BiH to judges and prosecutors in BiH in 2017, with the agenda including MEASURE-BIH’s presentation of JEI-BiH and HJPC’s presentations of 16 sub-indices. We also disseminated the hard copies of the 2016 JEI-BiH Report to 33 international donors/organizations and local bodies/organizations working in BiH justice sector. Our objective in presenting and disseminating JEI-BiH results widely to the professional judicial community and the relevant international/local organizations is to make the Index available to decision-makers and all relevant stakeholders, as a reliable and objective measuring tool to track BiH judicial performance and to inform evidence-based decision making in this sector. Center for Civic Initiatives (CCI) and Center for Civil Society Promotion (CCSP), implementers of the USAID/BiH Civil Society Sustainability Project (CSSP), organized a one-day workshop on monitoring and evaluation (M&E) for the CSSP sub-grantees. The hosts invited MEASURE-BiH to prepare and deliver a half-day training on Introduction to M&E. The training was delivered in three parts: the role and key concepts in M&E (including logframe), indicators and data quality, and basic evaluation approaches. Around 30 representatives from 21 civil society organizations (CSOs) participated in the training, which provided recommendations to CSOs on preparing both project-based and organization-based logframes, managing M&E planning and reporting, and using M&E data for internal management purposes and for reporting to funders. Lecturer also focused on USAID's M&E rules and practices. Training was delivered by Naida Carsimamovic Vukotic, MEASURE-BiH Chief of Party. The workshop took place at Hotel Sarajevo premises on June 9, 2017.